The C3 series is a gravity-fed dual-site handler, which can accomplish multisite test. 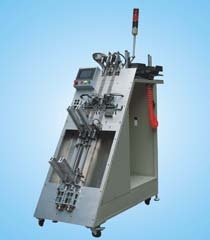 The series is composed by four parts ,including auto loader section, linear rail section, test section and unloader section. With PLC controlling，it’s workable for several different IC package styles such as DIP, SOP/HSOP, SSOP. The C3 series has gained a good reputation from major users for the high UPH, low failure rate and high reliability performance.